Thomas Hutchins was an American surveyor, mapmaker and the first "geographer of the United States." Hutchins was born in the colony of New Jersey in 1730. Prior to the American Revolution, Hutchins served in the British army and participated in the French and Indian War. During the Revolution, Hutchins served in the British Army. In 1779, the British government charged him with treason, prompting Hutchins to resign his commission in 1780. On July 11, 1781, Congress appointed him as "geographer of the United States." 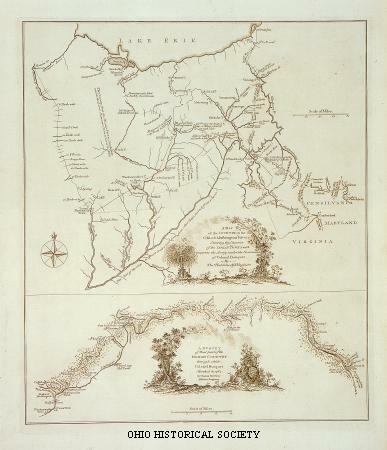 After the American Revolution, Hutchins continued as a geographer, surveying and making maps of the western frontier. Hutchins was given the job of plotting the land set aside for the Northwest Territory as a result of the Land Ordinance of 1785. He and his men laid out four of the Seven Ranges, which organized early settlement of the territory. Hutchins died of illness on April 18, 1789, before he could complete the survey of the final ranges. Hutchins had previously visited and mapped portions of what is now Ohio, when he participated in Bouquet's Expedition in 1764. Hutchins's survey work in the newly-seized Northwest Territory illustrates the difficult conditions that existed in Ohio in the years following the American Revolution. The geographer's first expedition to the region was cut short by the threat of American Indian attack, and the second expedition only began its work once it received military protection. In particular, the Shawnee posed a serious danger, as they were upset about Anglo-American settlers' invasion of their lands. The Wyandot and Lenape (Delaware), similarly, did not consent to the treaties signing this American Indian land to white settlers.